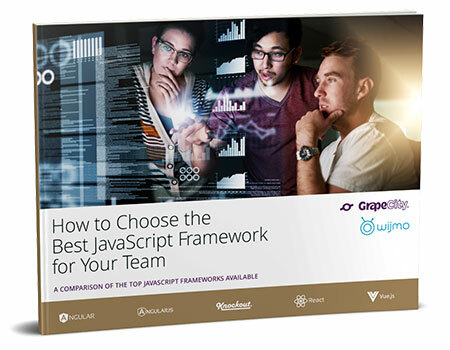 Wijmo's framework-agnostic controls include first-class support for top frameworks. 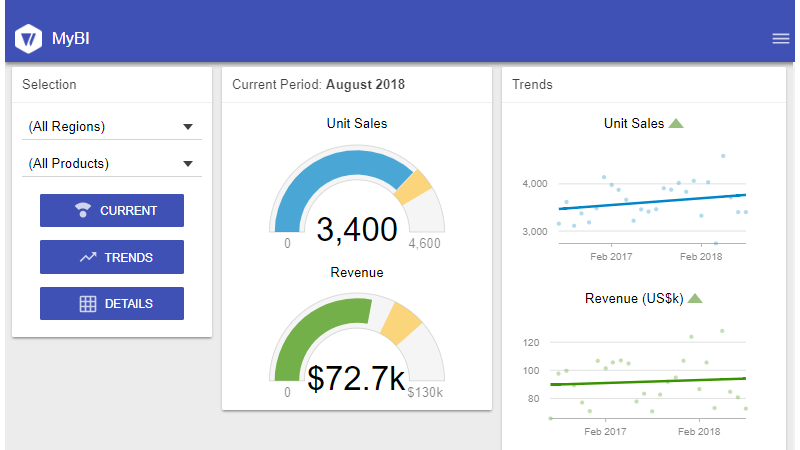 This BI dashboard is a progressive web app using Wijmo controls. Track up-to-the-second trading information with a combination of Wijmo controls. Process and aggregate thousands of rows in milliseconds with no server-side dependencies. Not available in Wijmo Core. Instantly create stunning, advanced stock trending visualizations with this powerful financial chart control. Not available in Wijmo Core. 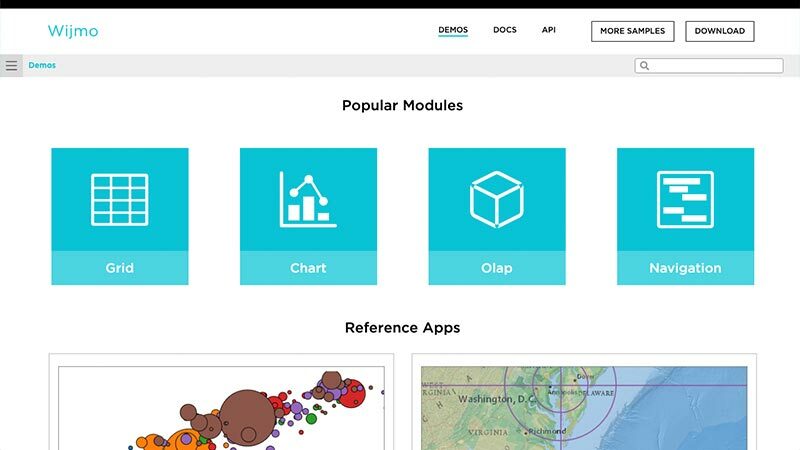 Explore Controls & Features in Every Framework! 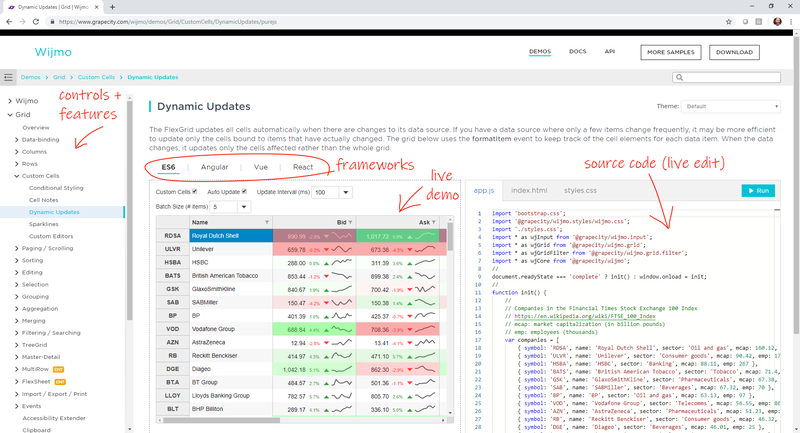 We wanted to make it easy to find any feature you need, try it in the browser, view the source code for your favorite framework, and even make live edits to the code. We wrote over 200 new documentation guides that will help walk you through using our controls and implementing features. We have rebuilt our API Reference. We designed it to be consistent with our other new developer resources. We added a FlexGrid.errorTip property that allows you to specify a Tooltip to use when showing validation errors. You can use this property to customize the tooltip, or set it to null to restore the original behavior. 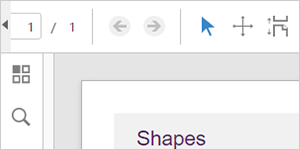 We added an option to FlexGrid called anchorCursor, which changes the range selection to look more like Excel. 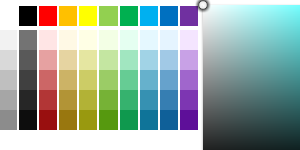 We refactored and simplified the grid CSS rules so customizing cell backgrounds is now simpler and easier. We improved the FlexGrid scrolling performance even further by extending the cell reordering logic to work when scrolling horizontally and on grids with frozen cells. 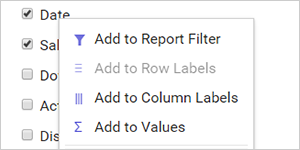 We added a new PivotGrid.outlineMode property in OLAP. In outline mode, the PivotGrid renders row fields in an outline format that is more compact and reduces the amount of white space shown on the screen. We added two new features that make it easier to customize specific series. 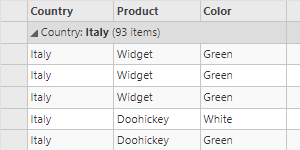 FlexChart has a new Series.tooltipContent property that allows you to customize tooltips for specific series. 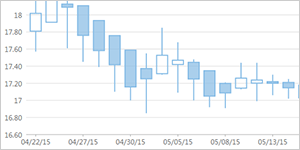 We have added support for range area charts to FlexChart. 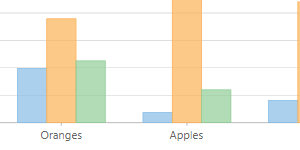 You can now use FlexPie to visualize more of your data in a single chart by creating multiple pie chart "series" using the same data source. Wijmo npm packages have been moved to the @grapecity scope. 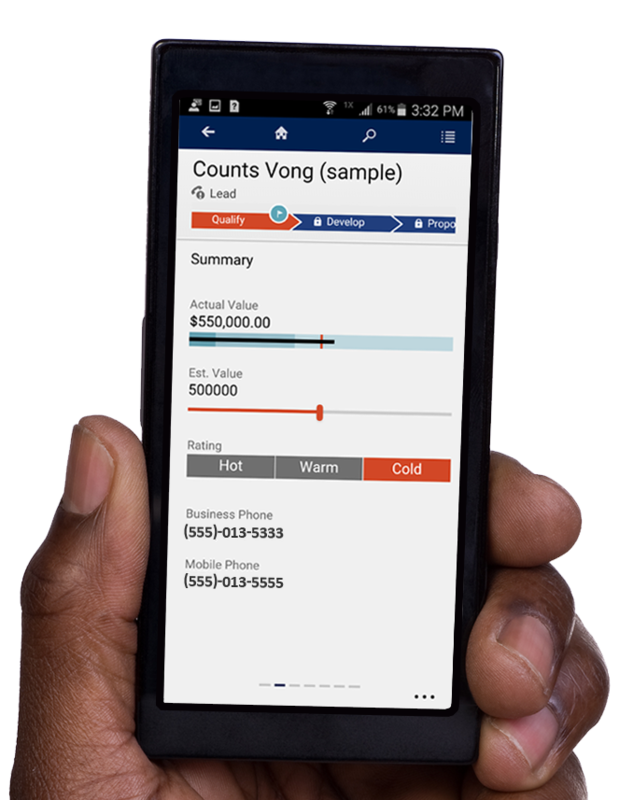 With Wijmo's extensibility model, the Microsoft Dynamics team was able to quickly customize and incorporate Wijmo 5 controls into our new release. We rely on functionality of Wijmo Core's FlexGrid in our massive next-generation platform products. Wijmo's modern, full-featured FlexGrid with sophisticated grid manipulations is what you will find at the heart of our workflow. We purchased Wijmo and their team is doing a great job - good-looking, well-thought-out architecture; documentation; keeping up with ever-changing landscape like no others. Keep costs low with our royalty-free licensing and subscription model that includes three major releases! Wijmo is licensed per developer. Once you purchase a copy, you can generate a distribution key and deploy your app. To create your own commercially-licensed SDK, or web application builder, choose the Commercial OEM license. Commercial OEM and SaaS licenses are customized for each customer. Our EULA includes in-depth information on Wijmo's licensing and legal agreement. These legacy jQuery controls are currently in maintenance mode. Read more about Wijmo 3. If you want to use Wijmo to create your own commercially licensed SDK, or web application builder, choose the Commercial OEM license. 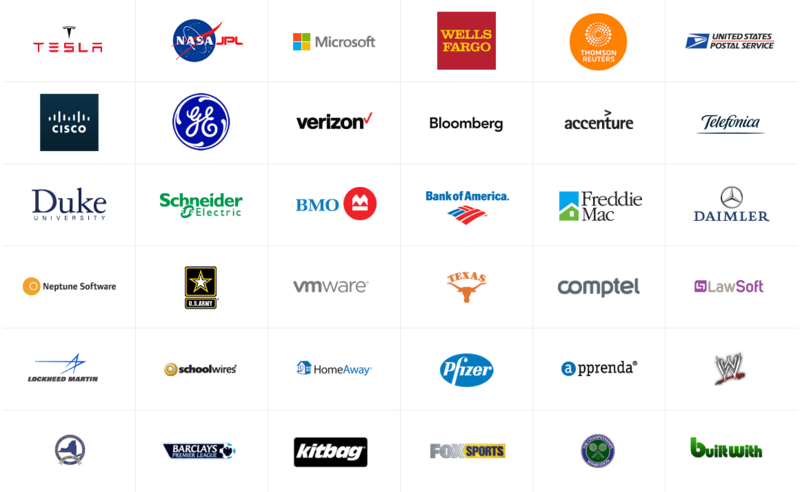 Since use cases vary widely, Commercial OEM and SaaS licenses are customized for each customer.